The Israeli Gold and Medals, Corp recently minted its first gold coin to commemorate Jerusalem Day. The creation of this Israeli bullion caused a ripple of excitement among coin collectors and speculators. 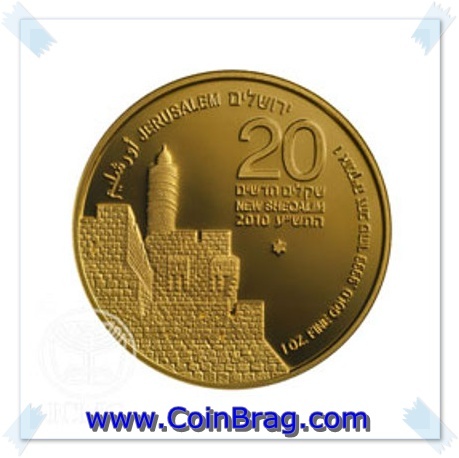 The coin itself contains 1 oz of fine gold with a value listed at 20 New Sheqalim (NIS 20). The Tower of David is first in a series of gold bullion to be minted. The series theme is called: Gold of Jerusalem. Each coin will depict a revered historical site in the old city of Jerusalem. The next coin in the series is slated to be the Western Wall in 2011. These coins are legal tender issued by the Bank of Israel. The Tower of David coin depicts the Temple of David standing proudly above the Jaffe Gate and the old cityâ€™s walls. The word â€œJerusalemâ€ is written in Hebrew, English, and Arabic. 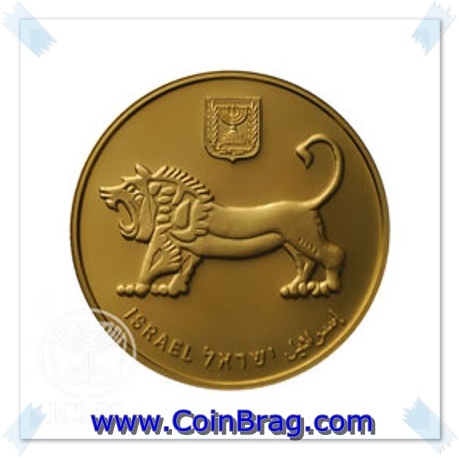 The reverse side will be a constant in the series and features the Lion of Megiddo and the emblem of the State of Israel. The Lion of Megiddo is the symbol of the Tribe of Judah and the city of Jerusalem. Both front and back of the coins contain the words: â€œ1oz fine gold .9999â€. The particular image of the Lion was taken from an ancient seal excavated in Megiddo in the Jordan Valley in 8th century BCE. The coin was one in a series of a limited edition with only 3,600 in print with a strict limit of 5 per customer, making it an instant collectorâ€™s item, as well as, sound financial investment. Israeli bullion are priced according to weight and the daily pricing of gold set by the international market (plus a small premium), therefore the pricing on the coins in the series will not be set or permanent. The prices will be set each day at 9 am (Israel time) and remain for 24 hours. The Tower of David Coin was priced at $1,467 on its opening day and there was such a demand for the product that the phone lines at the Coins and Medals, Corp. went into overload and crashed. The Israel Coins and Medals Corp website states that the Star of David is a mint mark, however, that is not entirely accurate. The Star of David is the mark used by the Israel Coins and Medals Corporation and not an actual mint. Although the company is owned by the Israeli government.